A towering mass of stinking meat, gorged on tormented souls. Asylum demons are creatures of sloth and will remain relatively placid as long as they are supplied a steady diet of souls, since they aren’t especially picky about the quality of the souls they subsume and so Asylum Demons make excellent guards for the prisons of evil despots and mad wizards. These demons are boisterous and lazy, always wielding huge weapons that only allow them to attack every other round, even with their huge strength. Rumors about Asylum Demons will emphasize their slow ponderous nature, relative immunity to ranged attacks and ability to crush armored targets with ease. *The enormous mass of the Asylum Demon gives it a near immunity to missile attacks, all missile attacks do 1 point of damage to the Asylum Demon. ** The Asylum Demon has three different types of attack, which it will use tactically based on the party’s actions once every other round. Sweep: The demon will attack sweep its huge weapon, usually a simple club of enormous size, smashing all who have engaged it in Melee. A dexterity check will avoid the attack, but those who fail will take 1D8 damage. The Asylum demon finds this attack unsatisfying compared to Crushing an enemy, and will only use it if it can catch more than one opponent at a time. Pounce: Should its enemies retreat and harass the demon from a distance it will take to its puny wings and awkwardly drop onto its enemies from above up to 80' away. This clumsy attack can easily be avoided, but the demon’s target and anyone within 10’ of it must save vs. paralysis or be stunned for four rounds, setting them up for a another attack. Crush: This crushing attack is aimed at a single annoying target and the demon's favorite tactic, which it will do as long as an enemy is in melee. The attack does 2D8 damage and requiring a save vs. paralysis to avoid being knocked over and stunned for the next round. Asylum demons are clumsy creatures and this attack is made as a 0HD creature, they are also very strong and armor provides no protection against the attack which will be made against the target’s base unarmored AC. 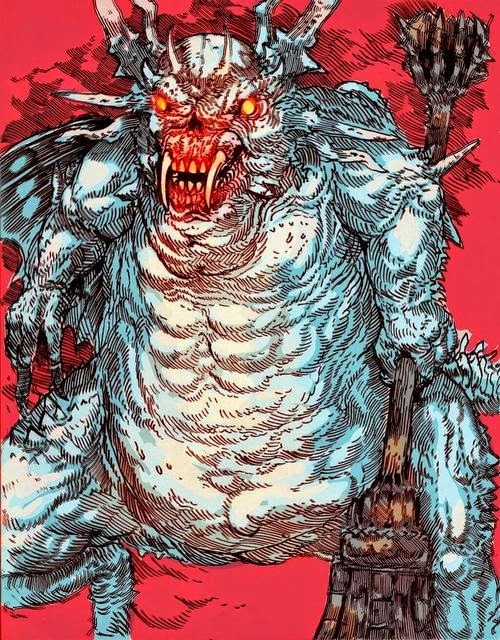 This post is inspired by a recent Post of Brendan's over at Necropraxis and I would like to think a contribution to a conversation about monster design. Brendan has a preference for monster special defenses as a basis for trick monster design, I'm not opposed to special defenses, I just think they're harder to run as a GM then special attacks. Thus while he's designed a defense base version of the Asylum Demon (the first boss from the video game Dark Souls) I've worked out an attack based version. The statistics are designed with LOTFP or B/X in mind and assume the existence of LOTFP's offensive and defensive fighting rules. The way one defeats the Asylum Demon (or at least the way I did after 14 trial and error deaths) in Dark Souls was to leap on its head to stab it, and then circle around it, dodging its attacks and hacking at it's giant horrible looking haunches. In D&D terms this might be a backstab or flank attack followed by a series of rounds alternating between defensive and offensive attack. The way I would figure the demon attacks in a D&D game is to sweep if the party tries to mob it, pounce if they run away and try to peck it to death with arrows then crush them. If the party engages the demon by dispersing around it (perhaps after that backstab, which should take of a good 30% of its HP) and stabbing fiercely during its wind up every other round while backing out of melee except for the most dexterous fighter or thief who engages the demon in some sort of defensive effort. A character with 1 point of bonus dexterity AC in full defensive mode will mean the demon has to get a 16 or better to hit (using LOTFP), while a really nimble PC will need an 18 to hit (assuming a +4 AC bonus for fully defensive fighting). While this is still a risk for the demon baiter, and a successful strike has a really good chance of killing its victim if they are low level, the demon should go down in a few rounds of focused attack, given that it's AC is quite low. I would say that tactics in old-school D&D usually occur on the dungeon- rather than the encounter-level. What you have here is about the limit of complexity that old-school D&D is capable of (at least in terms of boss attack patterns). Actually it seems a little bit 4th edition-y. In the last paragraph, you discuss tanking and dps races, both concepts with strong roots in MMOs. This isn't a bad thing (I use a lot of complicated boss mechanics in Pathfinder), just a bit unexpected. It works, though. These are certainly tactics that an OSR game can support. Also, in video games it's pretty trivial to attempt a boss 14 times. The same isn't true for tabletops. If players have to learn the bosses attack patterns (attacks every second turn, has an AoE sweep and an AoE pounce, etc) the first time they fight him, it'll be a lot harder.